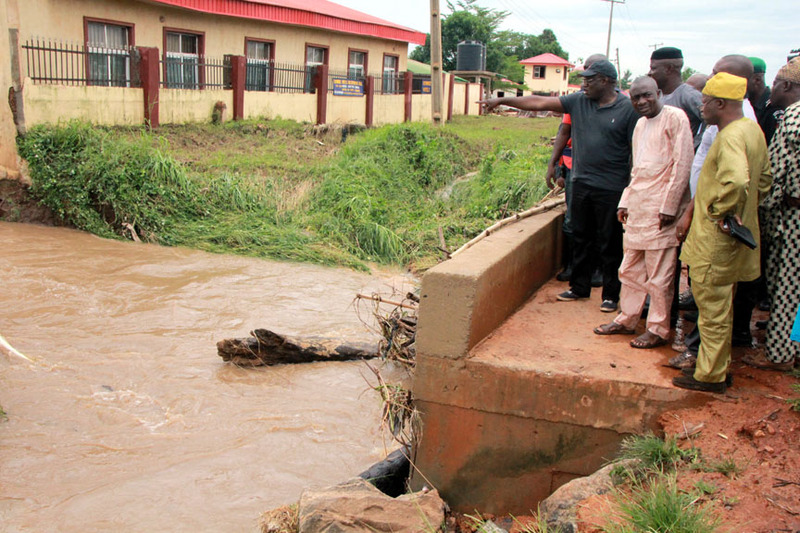 ADO FLOOD Ekiti State Governor, Dr Kayode Fayemi, pointing in the direction of structures and flooded areas, after a heavy down pour, in Ado-Ekiti... on Monday. President Muhammadu Buhari, represented by former Ekiti State governor and Minister of Mines and Steel Development, Dr. Kayode Fayemi, yesterday, flagged off distribution of relief material to 300 flood victims in the state. Fayemi told the flood victims that Buhari was concerned about the plight of victims of natural disasters, such as rainstorm and flood, many of whom have been rendered homeless and assured of more relief materials from the Federal Government. The materials distributed to the victims were bags of rice, millet, cement,corrugated iron sheets, nails, blankets, mats, clothing, asbestos, underwear, toiletries, detergents, among others. Director General of the National Emergency Management Agency (NEMA), Mustapha Yinusa Maihaja and Governor Ayo Fayose, represented by his Special Assistant on Emergency Matters, Mr. Akinwale Rasheed and General Manager of the State Emergency Management Agency (SEMA), Mr. Femi Osasona joined Fayemi to distribute the items. Some of the beneficiaries included the Alayegunle of Ayegunle-Ekiti in Injero Local Government Area, Oba Johnson Folorunso Aderiye, whose palace roof was blown off by rainstorm. Fayemi disclosed that Buhari ordered NEMA to send the relief materials for distribution to the state because he was concerned about the effects of rainstorm and flood on the people of Ekiti state. The minister explained that the president was ready to assist all Nigerians irrespective of their political affiliation, religion, ethnic background, culture and language. He stated that Ekiti had received lots of assistance from the Buhari administration, including two tranches of bailout funds, Budget Support Fund for 13 months, Paris Club refund and N2 billion Ecological Funds. Fayemi said: “The President believes that he is the president of all Nigerians and that is why the states that had benefited most from his government are opposition states because it is Nigerians that are living and working there. The NEMA DG Maihaja, noted that Ekiti was one of the states that first experienced rainstorm around February which he said was witnessed in about 27 other states. Maihaja said climate change caused many natural disasters to victims across the country noting that natural disasters and floods can overstretch federal and state governments. He added: “On behalf of my agency, we express our deep concern and sympathy to all the people that were affected.